Every year, hundreds of thousands of visitors flock to Bournemouth to spend three jam-packed days in awe of a huge assortment of propellers, pilots, marines and fireworks. But, if roaring jets, marching bands and fish 'n' chips don't float your proverbial boat (yep, there's boats too), here's a guide to the many other treasures awaiting those in search of something a little less... ahem.... plane. Pokesdown is a suburb to the east of Bournemouth, which is now known as the Vintage Quarter. Packed full of vintage shops, quirky cafes and dusty book shops – it’s the perfect place to spend the afternoon rummaging for individual treasures. After hours making your way through the rails of Aladdin’s cave style shops, why not take a break at Coffee and Dice – home to great coffee and cakes and every board game imaginable! No really, they’ve got everything from Arctic Scavengers to Zomicide Black Plague. Highcliffe Castle was built in 1835 by Lord Stuart de Rothesay to incorporate medieval stonework and stained glass from around the world. It is a superb example of Gothic Revival style. Tours of the castle are available at the reasonable price of £5.95 PP for an hours tour and the grounds are free to explore. After exploring, you can enjoy a leisurely afternoon tea at the recently re-branded Castle Kitchen and relax while tantalizing your taste buds with scones, cakes and finger sandwiches as part of this the quintessentially English tradition, something Harry Selfridge himself might have enjoyed when he leased the castle back in 1916. In fact, just a short walk to nearby St Mark's lies the grave of the great department store magnate, who died penniless in 1947. Spend the day obliterating brain cells in Springbourne (with an Escape Room). Head to Springbourne (a short stroll from Lansdowne or the Train Station with a couple of super sleuthing friends), to sharpen up your problem solving skills in one of Bournemouth’s Escape Rooms. The M.A.R.V.O experience lasts around 90 minutes; 60 minutes in the game room with 20-30 minutes for briefing and debriefing. After exhausting all possible brain cells (and hints from helpful staff), head to The (ahem) Firkin Shed to deliberate over your now questionable friendships, figure out just how you failed to escape M.A.R.V.O, and enjoy a crisp real ale or giant scotch egg. P.S You can leave The Firkin Shed in a much simpler fashion, by using your smartphone. Yes folks, this is a strictly ‘no phone’ area. There is a piano though, and a dart board. Just a stone's throw from Bournemouth, beside the stunning Palaeolithic (stone-age for the uninitiated) headlands of Hengistbury Head, lie some of the most expensive beach huts in the land – there’s even a land-train to easily traverse the 1.6mile flat walk. Once you’re up near the huts, think about heading to The Beach House restaurant for something to eat – from fresh fish to pizza and salad, with great views to match, or crack out a bucket and spade and get constructing sand-castles (for which Bournemouth University has the perfect recipe) with views looking straight out at the magnificent Wight Bear! Still time to spare? Jump on the water ferry to Mudeford Quay and finish the day in Christchurch town where there’s a Red House (museum), which funnily enough, has nothing to do with notable rockstar, Jimi Hendrix, who as far as we know, never frequented the area. Alas. Poole Museum (free entry), the Cockle Trail guided walk, treasure hunt and Poole Trail interpretation panels will help unravel Poole's past for explorers young and old! After enjoying a day exploring Poole then why not spend the evening at the legendary Mr Kyps. On the 2nd September Mr Kyps will be turning 18 and to celebrate RU40 will be playing – expect all the classics from ‘Red Red Wine’ to ‘Rat in the Kitchen’. Entry is free before 9pm and £5 after. The 'Bournemouth Colosseum' is a 19 seat cinema in the basement of Lavish Life in Westbourne Arcade. There’s a range of films showing from 1st – 4th September including Spotlight, 101 Dalmatians, Lock stock and two smoking barrels and Grace of Monaco. After the cinema why not pop into Renoufs for a unique dining experience. Specialising in cheese and wine Renoufs offers an award-winning selection of cheeses – from Mustard Seed and Ale Cheddar to Stinking Bishop and Little Black Bomber. Take a look at the impressive menu here. 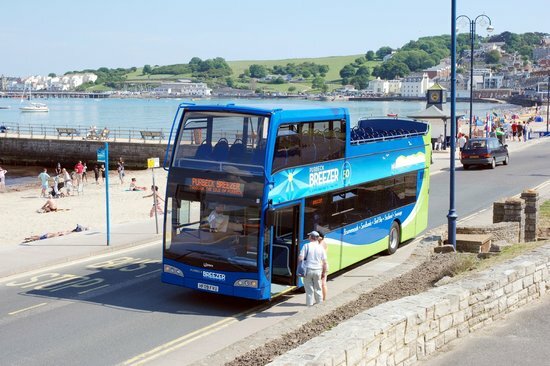 Hop on the Purbeck Breezer Route 50, which takes you from Bournemouth to Sandbanks, Studland and Swanage and take in the breath-taking scenery of the Purbecks, before reaching the beautiful Victorian seaside town of Swanage, with it's unique pier, and stunning nearby Durlston Point nature reserve and lighthouse. The place even has a Tardis.... Well, a Wimpy. 'SUP, Sandbanks? Water's up? OK, we'll stop now. If you fancy living like a millionaire, so fricking bad, then head to Sandbanks in Poole, where you can hire an SUP from the nearby Watersports Academy, and with a few handy pointers, you'll be gliding your way past houses owned by Harry Redknapp, Graeme Souness and even John Lennon's Aunt Mimi, with not a Yellow Submarine in sight. If all that salty sea spray has gotten you parched, head to Sandbanks Yacht Co. for some refined refreshments and a good view of others smoothly gliding by (or frantically clambering back on their board repeatedly...) Nice. In between Ringwood and Fordingbridge, keen walkers will find the historic Moyles Court, which features on a mural inside Parliament. Yes, Parliament. Lady Alice Lisle, who once owned the great mansion, came a cropper allegedly protecting royalist soldiers during the civil war, which cost her her head. Spooky. Nearby is Rockford Common, with its huge crater sandpit, ideal for a stroll and a perfect picnic location. Failing that, there's always The Redshoot Inn up the road, which serves a plethora of locally-sourced ingredients on it's popular menu. Head out from Bournemouth centre to the beach, swing a left with the sea on your right, walk a bit, climb up a zig-zag, and you're at Fisherman's Walk. This quaint little garden walk will quickly get you to Southbourne, a trendy Bournemouth suburb well worth a look-in. From it's cutesy little handmade gift shops to the quirky Close Knit Cafe, Southbourne remains proud of its own unique identity outside of Bournemouth Centre. Just a short saunter away is Vitality Stadium, home to the recently promoted Premier League underdogs, AFC Bournemouth. These guys have fought off the likes of Manchester United, Chelsea, and Real Madrid... And you can often find a good deal on some merch in the club shop. Hang around outside for a few minutes and you might even catch a glimpse of manager, local legend and hero, Eddie Howe, whose monumental efforts are in no small part responsible for Bournemouth's historic rise to the top.